Thanks to Rich Taylor over at Youth Hockey Review for letting me repost this great article. As another youth hockey season begins I’d like to provide parents with a brief guide to help make this a great year. These suggestions are intended to help us keep one key point in mind – youth hockey should be fun. In our love for our kids, and desire to see them develop, many of us (myself included at times) forget that there are more important lessons at stake here than simply learning how to skate, pass and shoot. Hockey is a fun game for many reasons. But the fun can quickly be lost when parents loose perspective, and common sense, about what the game is really about – teamwork. So here are 5 common sense lessons that every hockey parent should keep in mind to make this, and every, hockey season more rewarding. 1. Hockey is a team game. Every team will have some players who are better than others, but team success depends on everyone learning to work together – in practices and in games. No individual, no matter how skilled, has lasting success in a team sport without learning to work as part of a team. As parents, you’re part of the team too. It’s your role and responsibility to work together – with the coaches, the other parents and the club. If you focus your attention solely on your child and his or her individual needs, you won’t be setting a good example – and your child probably won’t learn the full value of teamwork. 2. Let the Coach – Coach. Stop yelling instructions down from the stands or boards. Most of the time the kids can’t hear you anyway. You may not always agree with the coach, but you should respect their responsibility for leading the team. Sometimes their decisions will seem hard to understand – or in fact could be a mistake. Coaches make mistakes too. But when your child is always looking to you to make sure they’re doing the things you want them too – they’re not listening to the coach. If you don’t feel comfortable with your coach’s approach to practices and games, sit down and talk. Most coaches will welcome suggestions and input at the right time. But when you teach your child that he or she should focus and do what you say – because you’re the parent – you’re teaching him or her to disrespect the coach and that individual needs are more important than teamwork. 3. Be an example. Teamwork starts by being on time. Yes we’re all busy. You have other kids to care for and other places to be. But the time before your child steps on the ice is important. It provides valuable time to bond with other players, and the coaching staff. When your child is consistently the last one to practice, or gets to games just in time – but misses the coaches talk or warm ups – you’re sending the message that you and your family’s individual issues matter more than the team. That’s simply not fair to everyone else. Life happens, so when you can’t be on time, for whatever reason, at least shoot the coaches an email, phone call or text. By being a good example, and demonstrating you value your commitments to others, your son or daughter will learn to keep in mind how his or her actions affect others. 4. Kill the negativity. Your child may not always get equal ice time. Sometimes shifts run long. Young players don’t always listen to the coaches when they call for a change. Other times the coach may mix of lines or short-shift a line to try and capitalize on an opportunity. Maybe your child is playing a great game, when all of the sudden the coach sits him or her down to play another player who isn’t as skilled. The team might lose a game it should have won. As soon as you begin creating your list of “that’s not fair” you’re poisoning the water and showing disrespect for the coach, the team, and ultimately yourself. If you have a fair and good point about something you’ve seen that concerns you – raise it at the appropriate time and take it up directly with the coach. But don’t expect him to agree with you or your point of view (or else). It’s not constructive, or fun, to have a negative voice constantly raising concerns or frustrations. While most parent intentions are to help, many times their actions are in fact unhelpful. So the next time something hockey related gets you upset, think before you act. Try reframing the conversation and taking a more positive approach. You’ll be a better role model for teaching your child how to deal with challenges and adversity when they see you acting in a more positive manner. 5. Create a success journal. Talk to your child about the season to understand his or her goals. What’s really important to him or her from their perspective? Write it down. Then add a few key points and lessons that you as a parent feel are important. When finished, discuss your goals and expectations with the coach. Watch the action in games and practices – not just your child, but the overall teamwork and development as a group. In school your child follows a lesson plan, gets homework, and is periodically reviewed. 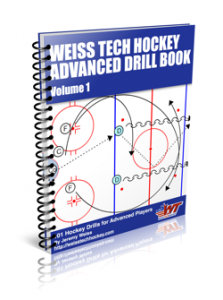 A hockey journal is a terrific and simple way to apply the same kind of practical, systematic and constructive feedback to help you, your child and even the coaches make the season as fun as possible while developing and improving every step of the way. Travel hockey is a big commitment – we invest a lot of time, money, energy and resources in the belief that it’s good for your kids. So let’s make sure it is good for our kids. Let’s remember our responsibility as parents to teach them the lesson of teamwork – whether we’re on the ice or off it. It’s a critically important factor for success in hockey – and in life.